Total nonfarm payroll employment increased by 160,000 in April, and the unemployment rate was unchanged at 5.0 percent, the U.S. Bureau of Labor Statistics reported today. Job gains occurred in professional and business services, health care, and financial activities. Job losses continued in mining. The change in total nonfarm payroll employment for February was revised from +245,000 to +233,000, and the change for March was revised from +215,000 to +208,000. With these revisions, employment gains in February and March combined were 19,000 less than previously reported. Over the past 3 months, job gains have averaged 200,000 per month. The last paragraph is a elegant warning to the reader: last month's figures were wrong. A tiny 3%. And the figures for the month before were also overstated by a mere 5%. Let's see whether those revisions are a one-off miscalculation, or a wider phenomenon. So. Over the 30 months for which we have the three data (the first announcement, the first and the second revision), 6,890,000 jobs have been created. That is great news. But that's also about half a million, or 8% more than announced at a first glance. While we should certainly welcome a conservative approach to statistics and surveys, an 8% error is pretty large. And it gets much larger if we consider the overall drift to prevent overestimation and underestimation to compensate one another: on average, the figure initially announced by the BLS (Bureau of Labor Statistics) is off by 15%! The analysts didn't do a very good job. On average, their estimate is almost 30% off. While they had a few good months, they had some catastrophic ones. The standard deviation of the difference between their estimate and the actual figure is also very high. Interestingly, we can see there that the analyst's estimate is generally closer to the final figure than to the first announced one. 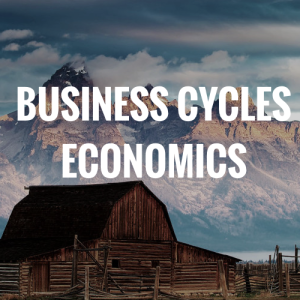 Analysts provide estimates that are consistent with trends. 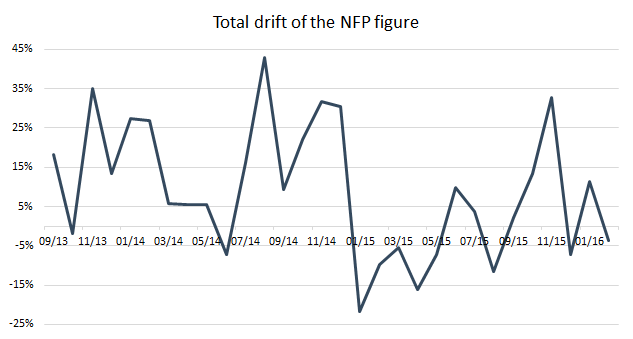 The median of the surveys displays low volatility: the standard deviation (a measure of dispersion) of the revised NFP figures is more than two times larger that of the analysts' forecast (69 vs 28). If analysts are only good at predicting a figure consistent with the trend, then we might want to use the 3 or 6 month average instead. Or simply refrain from forming expectations that are consistently proven wrong, month after month, years after years. BLS's figures poorly reflect reality, and the announcement effect around their publication is overrated. 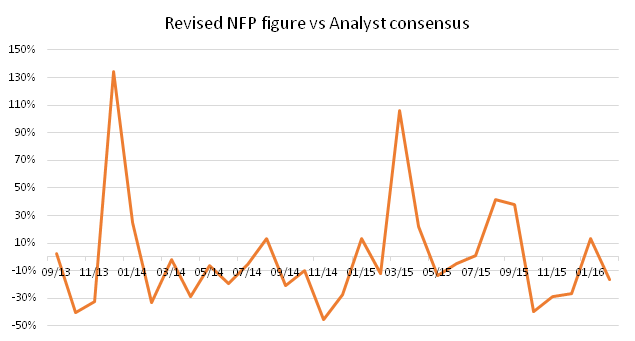 Analysts do a very poor job at forecasting NFP figures. Analysts are easily caught by surprise when out of the ordinary events happen.